On any given day, Samantha Dorsey can be seen surveying a 30,000 tree nursery and planning its future. 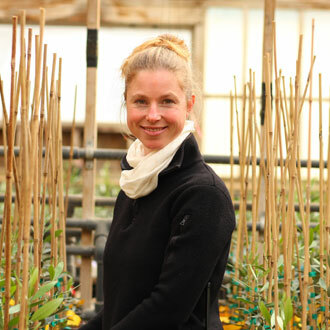 As McEvoy Ranch’s Nursery and Vineyard Manager, she is clearly enthusiastic not only about the expanding development of the nursery and the vineyard she oversees, but California olive oil industry’s future as well. But Dorsey jokes that the job she landed right out of Oberlin College in 2001 was just something to do until she could decide what was on her own horizon. Ten years later, Samantha Dorsey has figured it out. Her love for organic agricultural practices with a background in Environmental Studies blossomed into an accomplished career. With over 30 varietals of seedlings under her care and the ranch’s newest project to expand their wholesale nursery business, she thinks the future for McEvoy Ranch seems very bright indeed. While looking for a job in the organic agricultural sector after college, I found myself attracted to olive trees because they seemed to be an appropriate crop for California’s climate and limited water resources; I was fortunate to find work with the McEvoy family in my home county of Marin. The historical significance of the olive tree gives my work continuous meaning. From a farming perspective: developing more efficient methods of harvest to bring down the cost of production. From a marketing perspective: educating our customers about the difference between olive oil and other oils and the meaning of extra virgin. From a nursery perspective: defining the genetic markers for each olive cultivar so that we can properly label and sell the correct varietals to our customers. In particular, California’s Mission olive deserves more attention and better defined markers. I am so grateful for the opportunity to help grow a healthy source of fat which is an essential component of the human diet. Being a farmer is a very honorable position to hold when you grow a product with integrity. Our consultation services at McEvoy Ranch have led me all over California, into Oregon, Baja, and Arizona. It continues to be a pleasure to help other growers set up their own orchards and to play a role in the burgeoning olive oil industry throughout the West. As more mills come into operation, it is becoming easier for small growers to produce olive oil for small, local markets. Since the United States still imports the vast majority of its olive oil, we have a good opportunity as Western growers to team up and secure a larger market share together. The Sierras are full of wonderful camping locations. The cleanliness and austerity of the high desert are very relaxing. Honoring one’s word. You can get away with a lot of other things as long as you always do what you say you will do. The chefs at McEvoy Ranch make a wonderful salad with fresh tomatoes, chervil and olive oil. The chervil’s flavor is a little lighter than basil, leaving more room for the olive oil’s flavor. Tough one, but Kehoe Beach in West Marin makes a strong case for itself. Really, anywhere on a Pacific beach is hard to beat. Guiding McEvoy Ranch’s nursery through its current transition into becoming an exclusively wholesale enterprise has been a dynamic project. The nursery trees really need no sales pitch. They just need to be paired up with knowledgeable growers who understand plant material quality. Our wonderful retail partners have made it a smooth shift for us so that we can continue to provide our customers with the same excellent service but in many more locations throughout the state. I look forward to extending Mrs. McEvoy’s mandate to produce the best trees, accompanied by the knowledge to grow them, with many more new customers in the future. Any Thanksgiving, but most of all, it’s easy to remember the ones we are lucky enough to be able to celebrate with the season’s freshest olio nuovo. I love a holiday that is purely about families and friends coming together to show gratitude for each other and everything that their lives are blessed with. McEvoy Ranch’s vineyards have been a major focus for me lately. We have nine different varietals that we are growing for our own winery and it has been great fun to learn a new crop. The more I lean about grapes, the more I appreciate how sturdy the olive trees are.